As world petroleum product prices fall, Russian oil companies report record inventories of gasoline, totaling 1.9 million tons. Russian oil giants see slashing prices as a way out. In mid-April, Lukoil, Russia’s largest privately-owned oil company, announced a reduction in prices at oil depots and oil refineries, as well as at its own filling stations in Russia. Oil companies don’t usually cut prices in spring, when the demand is normally at its highest. A spokesman for Lukoil attributed the decision to the decrease in oil and petroleum product prices on the global market. He added, the company has always formed its oil prices based on the market. Two state-run companies — Rosneft and Gazprom Neft — followed suit. Rosneft cut gasoline prices at its plants by 1.8-5.4 percent, while Gazprom Neft’s prices went down 1-3 percent. This is the first major price reduction in the last 12 months. Besides international trends, gasoline prices are falling on the domestic market because the oil companies’ gasoline inventories were at an all-time high of 1.9 million tons as of April 1. Furthermore, Belarusian refineries are providing additional gasoline. Petroleum product imports from Belarus are projected to reach 3.3 million tons in 2013, including 2.1 million tons of gasoline, 1 million tons of diesel fuel and 200,000 tons of jet fuel. “We have more than enough gasoline now, everyone’s filled to the brim,” Bashneft president, Alexander Korsik, said in comments to Vedomosti. Will Rockfeller buy Russia's principal oil asset? Two years ago the situation was quite opposite. 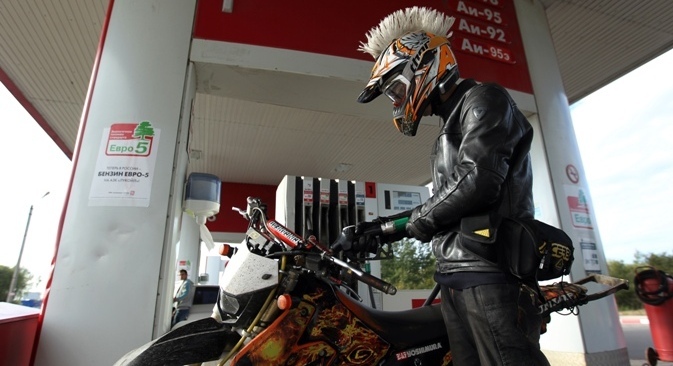 In early 2011, Russia placed a ban on Euro-2 gasoline sales, and a shortage hit the country in spring. A gasoline shortage made prices soar and many independent filling stations went bankrupt because refineries suspended supplies. The state then allowed sales of Euro-2, but banned them again in January 2013. In order to prevent unauthorized exports, the government imposed a prohibitive export duty on gasoline amounting to 90 percent of the duty applied to crude oil. The move proved effective, and producers focused on building inventories. For its part, the Federal Antimonopoly Service kept an eye on prices. No shocks were seen on the domestic oil market in 2012. Officials believe that there will be no crisis this year either, although oil product prices are likely to grow. The Energy Ministry expects a 13-14 percent increase in prices. Since January, gasoline prices have increased by 2 rubles. IFC Solid analyst, Dmitry Lukashov, doesn’t rule out that the reduction in prices is a response to a recent statement by the Finance Ministry, which demanded that the Federal Antimonopoly Service should exercise tighter control on retail prices for gasoline. Given the current level of excise taxes, oil companies are generating superprofits amounting to about 7 percent of the sale price, the ministry believes. The ministry is interested in reducing the inflation rate and is dissatisfied with the high gasoline prices, the analyst says. As a rule, oil companies follow the global trend when prices rise, but hardly ever do so when prices tend to fall, says Alexey Kokin, analyst at Uralsib Capital. “Gasoline output may have increased following upgrades of refineries, and the domestic market is more consumer-driven now,” he said. Although there is a tendency towards a reduction in retail prices, oil companies are reluctant to cut them, says president of the Moscow Fuel Association, Yevgeny Arkusha. However, if a downward trend should prevail, prices at filling stations won’t fall significantly. Higher excise taxes on fuel will be introduced on July 1, and prices will change accordingly.